I have been riding road bikes since, well a long time ago on columbus 531 bikes and sticky vredestein slicks was my choice back then, however in the last 7 years I have been back to the road bike in earnest and thought I would share some insights and feedback on key points I hear on rides, chats, etc, starting with tyre choice, tyre size, pressure and punctures. The last few years have seen huge advances to some of the top tyres, my 2009 tarmac pro came with dreadful specialized turbos, they were changed for continental gp4000s after the first ride. However I have now been running the new s-works on both my 2016 custom s-works tarmac and my 2011 bog standard Allez and they have been great. Likewise the 2011 tarmac came with tyres that had to be removed after the first ride; they were called "armadillos", presumably because riding them felt like you had strapped some armadillos to your wheel.. however if you have not tried the new 2015+ Specialized Tyres I cannot urge you enough to do so, they do not last long, but while they do they have the most grip and best ride, and have not punctured on me yet. The only people I know who have punctured them were running them very, very worn. And here we get to the first point. All road tyres inevitably pick up debris, especially bits of small glass and flint, if you do not remove these they can work their way into the tyre and puncture, similarly, if your tyres are very worn, this debris will go straight to a puncture rather than being embedded and removed before they puncture. Picture sent by a riding friend saying "no Gatorskins, no can join ride lol" when the problem is worn out tyres. So I have some riding colleagues who even puncture Conti all seasons gator skins with frequency, granted, some of them do some high mileage, but even so, I have others and even had my own high mileage seasons without a single puncture on lesser tyres and it all comes down to a few things, assuming a clincher + tube set-up. 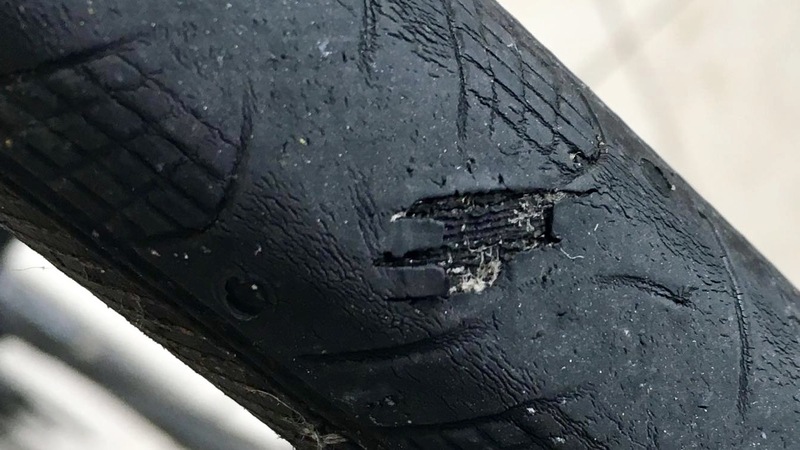 Only ever use Vectran or equivalent breakers, even light tyres like the Conti TT have a single layer on the main tread and this will stop / thwart glass and other debris causing a puncture. 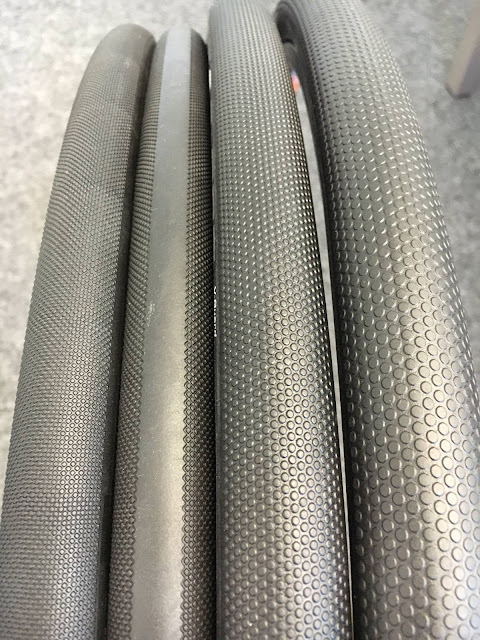 Nylon breakers just do not cut it in the UK, they do in other climates but I just do not see the point with such amazing tyres from Schwalbe, Continental and Specialized that I know of that roll great, grip great and will resist pretty much anything you throw at them and are very light. Install the tyres clean and dry. If you have to change a tyre at the roadside at all, moreso even in foul weather, do a proper job of cleaning bike and tyre, taking tyre off and inspecting inside, talc and preferably a fresh tube (the one you used roadside can go back in saddle bag) and the chances of puncturing will be greatly diminished. To that end I use very thin conti supersonic (install with care as you can snakebite them just installing them) or latex tubes, but I do not carry these as spares. The chances of you a) installing an ultra light butyl tube roadside without snagging it are minimal and b) the chances of keeping a latex tube in good conditions are minimal also, carry a decent semi light or full weight tube in a plastic bag with talc. Carry tubes in a dry, talced bag... rubber perishes when wet, wet tubes stick to tyres and increase rolling resistance, installing a perished, wet tube that has come from a soggy saddle bag or equally soggy sweaty jersey pocket without a plastic bag to keep it dry, well, is like asking for a permanent roadside assistance job. Seal a hole in the tyre from the inside with a patch. If you do get a dirty great hole in a tyre, then leaving it is just a countdown to water ingress / dircet ingress induced puncture. Patch any holes or cuts from the inside when you are doing point 2 above. Talc and seal tubes: A tube kept in a moist saddlebag or jersey pocket is going to be half done before you even install it! There is a trend to wider tyres (23+) on road, but this has to be matched with wider rims to get the best benefit, even from a comfort point of view let alone an aero point of view. Wider tyres can give lower resistance, if supported properly and not outweighing other negatives. There is no point putting bigger tyres on a thin rim as to stop the tyre squirming on the rim round corners you will have to have at least the same if not a higher pressure than with a thinner tyre. There is no point spending a fortune on aero wheels that have been tested to the nth degree in wind tunnels to then spoil it (litterally) by putting a spoiler on it. 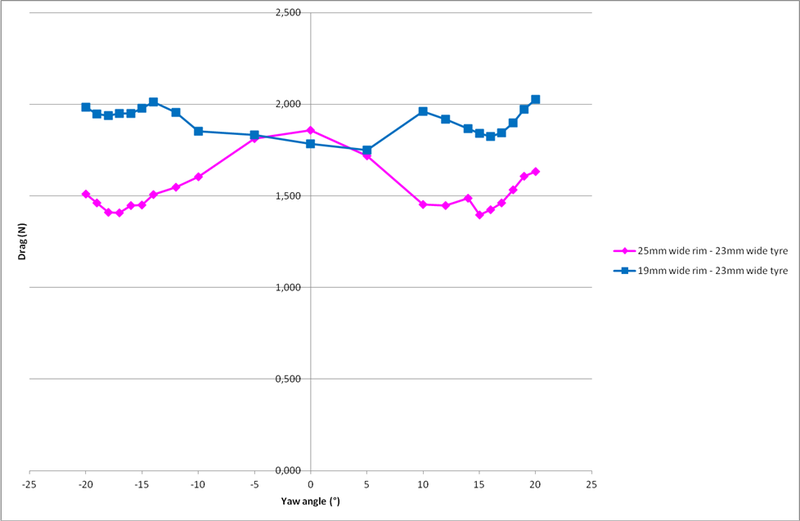 This is a point many overlook when looking at data in isolation (rolling resistance for example) but tgere is no point saving 2 watts rolling resistance with wider tyres to then loose huge yaw angle benefits on aero wheels. Both Zipp and Mavic have good articles on this, but for me the easiest and most succinct is this one from Mavic engineers blog point 3.3 half way down. Conversely however, there is also significant benefit of just wider rims with the same tyres, which gives more volume and if you read the link to the Mavic engineers blog, better aero also. 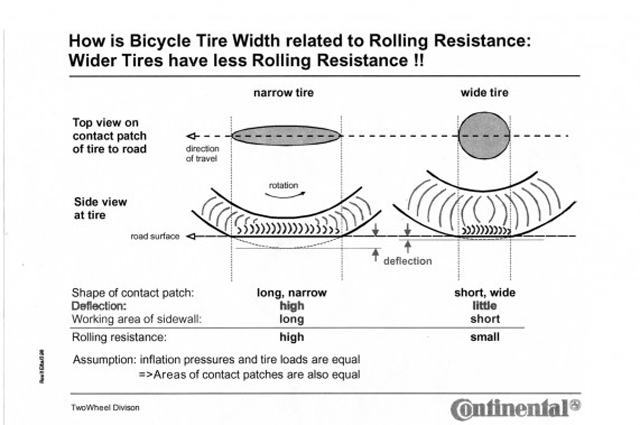 For me, both from MTB and road experience, better handling is the biggest upside as the sidewall is properly supported at wider pressure variations. With the sidewall being more or less the same width or shallower than the rim rather than extending beyond the rim, it is my experience that you seem to have better aero at more angles, this is upheld by the Mavic link above, but also in the real world, the tyre handles better around corners and over poor road surfaces as it tracks surface imperfections better at wider pressures . I have tried varying rim widths and tyres and find, as a lot of the aero and rolling resistance data seems to err on the side of wider rims, tyres that do not buldge out wider than the rim. Many Tubeless tyres have an extra layer of rubber / butyl and so are heavier to start and product managers skimp on puncture protection to balance the weight. That is generally not an issue as sealing holes in my experience is more effective than trying to stop them. Latex and thinner tubes last longer as they are exposed to less grime and/or water ingress. These wheels are the old school 13mm inner bead width so they generally wear: Continental GP4000s, Specialised Turbo S-works, Specialized / Schwalbe tubeless, all 23/24c. The first tubeless tyres shod on this bike were the hutchison atom / fusion / intensive combos, followed by the Schwalbe ultremos which were discontinued. My semi aero wheelset is the slightly wider Campagnolo Bora Ultra clincher. With 17mm inner bead I can run wider 25c tyres well, however I tend to just enjoy the same tyres as above, just with better grip. Tubeless I have been using also the specialized sworks turbo tubeless, roubaix tubeless (training wet) and the discontinued ironman tubeless tyres. 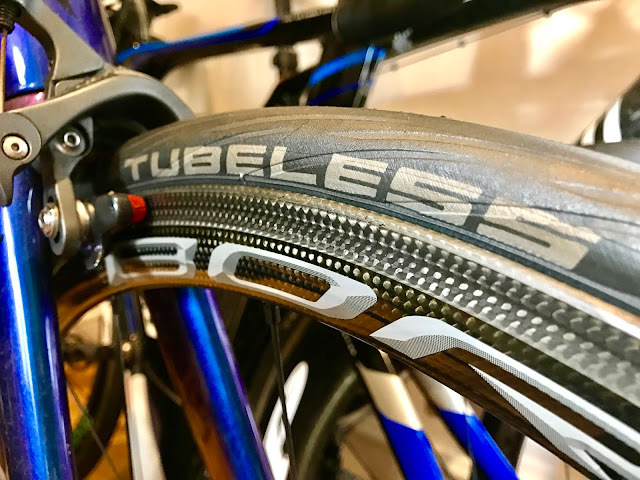 road tubeless and semi aero go well together for a fast puncture proof combo. 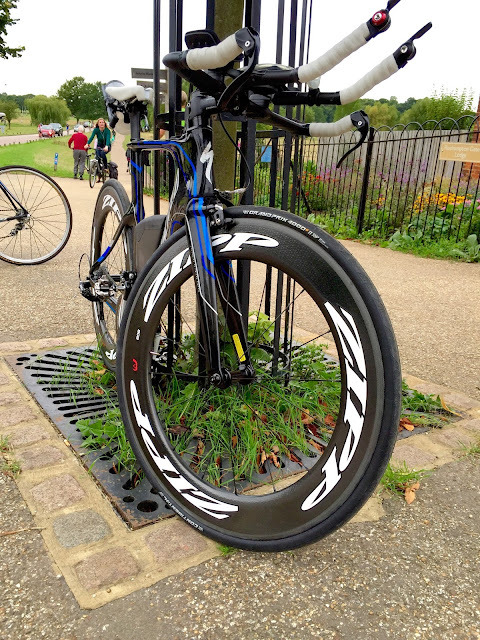 My aero wheelset is a Zipp 808 wheelset with a zipp 404 front for windier days. These are about as wide a rim brake wheels will go and will quite easily take 25mm tyres, however as you can see above the do stick out and so I only ever have these on the back. With inner tubes, my new favourite is the Continental TT tyre... wow that is a fast tyre. I also use the conti 4000s2, both with 23c front and generally a 23c or 25c on the back. Continental GP4000s and s2 are possibly the most versatile road tyres out there.